Seeing a car driving by with tinted windows conjures up a number of images. A degree of curiosity surfaces gradually from the watching public. What type of person is sitting behind the darkened glass? Is this a celebrity or someone who does not want to be known by the outside world? Not being able to see into the vehicle is the source for many of these questions. Unfortunately, some countries view glass tinting with suspicion and penalize car owners who use it. This is understandable perhaps from a law enforcement point of view (e.g. criminals not wanting to be noticed), but there are valid reasons why the glass is tinted that have nothing to do with recognition or notoriety. Tinting the glass in a car has a lot more to do with having a comfortable ride than creating any air of mystery about what’s going on in the back seat. Cars can turn into small baking ovens in the hot sun of the summer or in tropical areas. Turning up the air-conditioning can reduce the heat but does nothing to prevent irritating glare from solar radiation. Glass tinting reduces both heat and glare, making a drive through traffic congestion a lot more bearable. Tinting is energy effective. Many companies are tinting the glass of their properties and there are some serious commercial reasons for doing it. Hotels and office buildings want to create relaxing environments for employees and guests, and obstructing glare removes an irritant. There are also energy costs to consider, since blocking sunlight makes a space cooler and reduces the need for air conditioning. Radiation from the sun can damage to both carpeting and furniture, requiring expensive replacements. Given the number of units with beds and upholstered chairs, it is no wonder why hotels will take steps to tint windows in the guest rooms. The average consumer may want to consider tinting window glass as a means of reducing home energy costs through counterbalancing. The US Department of Energy has noted that up to one third of the heat loss in a residence is due to the doors and windows. Tinted glass helps keep the heat inside and balances any loss occurred due to door drafts. Granted, the reduction in carbon based energy consumption is not nearly as dramatic as using solar panels or smart glass. But tinted glass can make a difference, and in the summer its ability to block excessive solar heat helps keep air conditioning costs down. Incidentally, tinting is not a major expense. Window films are available for residential homes and applying them to windows can be a DIY project. 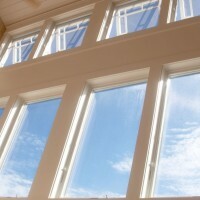 Moreover, there is a tax advantage for Americans using energy saving window film. Originally offered in the Energy Policy Act of 2005, certain energy conservation tax credits have been extended until 2012 by the 2009 American Recovery and Reinvestment Act. The credits are there to encourage the use of window film and can be used at installation. Glass tinting can be seen as a preliminary step in a process whereby a business or a home can becomes increasing more energy efficient. If one considers that car air conditioning will require gasoline to be consumed, tinting car windows can make a dent in carbon emissions. Perhaps not a sizable step, but it is one that does promote greater energy efficiency and a smaller carbon footprint as well as improving quality of life.